You’d think the man behind one of architecture’s most timeless works—a place often called the “eighth wonder of the world”—would be celebrated, or at least be invited to the opening ceremony of his crowning achievement. In 1956, the Honorable Joe Cahill, the New South Wales Premier, announced his selection for the design of the upcoming Sydney Opera House: Scheme number 218, a series of five auditoriums sheltered under enormous, geometric slabs of concrete designed by a relatively unknown Danish architect named Jørn Utzon. While he’d won several smaller competitions in his own country, Utzon had never found acclaim elsewhere. The story goes that his designs—not much more than a simple diagram of the iconic structure—were discovered in the rejection pile and declared “genius” by judge Eero Saarinen, an architect and designer known for his neo-futurist style, many of which, like the TWA terminal at JFK airport in New York City, echo similar themes as Utzon's forward-thinking design. Utzon’s grand vision recalled sails billowing over Sydney Harbour, with the building’s 14 partial shells inspired by orange peels, intended, if combined, to fit together in a perfect sphere. But grand quickly became grandiose, as construction began before Utzon had completed the blueprints or even figured out how to support the weight of the enormous spherical shells. It’s easy to blame the inexperienced Utzon for the series of maladies ahead: His plans were certainly ambitious, designed without structural solutions for the most extravagant features. He took on too much responsibility, tackling design troubles single-handedly until the situation grew dire. The project bled money. Utzon took leisurely vacations and moved to Palm Beach, spreading himself thin over multiple projects. Trouble brewed in the New South Wales government. Robert Askin—a longtime critic of the project—took over as Premier, exerting unprecedented control over the project’s budget. His new Minister for Public Works, Davis Hughes, questioned every decision, schedule, and cost, and eventually stopped paying Utzon. At Askin’s election party, Hughes' daughter promised that Utzon would soon be fired. Her prediction was true in spirit, if inaccurate in its specifics: In February 1966, with the government owing him $100,000 in fees (which left him unable to pay his staff’s salaries), Utzon walked off the job—he actually climbed over the back wall of Askin’s office yard after a tense resignation meeting in hopes of avoiding the press. The country erupted, with protests and marches filling Sydney’s streets, but Askin and Hughes would not be swayed. At the time, the project had racked up just $22.9 million in costs; after bringing in a new architect, expenses swelled to $103 million, about 1457 percent over budget. 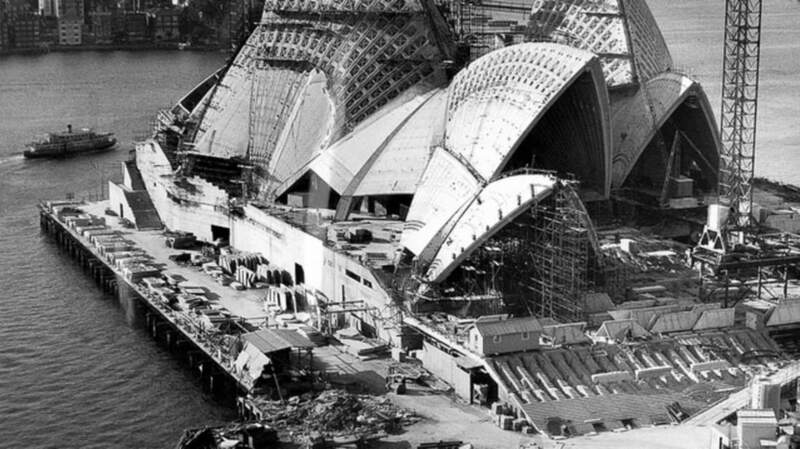 Seven years after Utzon’s resignation, Queen Elizabeth II opened the opera house in a grand ceremony—to which Utzon was not invited, nor his name even mentioned. Even after returning home, his native Denmark caused him grief. As a homecoming gift, he was slapped with an enormous tax bill and blacklisted by the Danish Architects Association, who told him “in no uncertain terms that his actions in Sydney were 'deplorable, the clients were always right, you can never leave a job' and what he had done was damaging for the architecture profession,” according to his son, Jan Utzon. The Association eventually rescinded their ban in 2013.